Every thing about Anthi's exceeded our expectations. The owners were fantsatic - there to meet and greet and available all day every day. Room maintenance great. Perfect hosts. The location is fantastic - 150 yards from the harbour centre - perfect views of the bay, beach and Ithaca but literally just round the corner of the harbour. Peaceful morning balcony coffee looking at the bay and then off to the harbour for the great breakfasts in any of the restauarants all 1 metre from the waters edge. It doesn't get any better. The main road up from the aiport is closed at the moment - that just means detouring through the mountain roads through all the little villages - another great additon to seeing Cephalonia. Fiskardo is one of the best little harbours in Greece - if not the world! Perfect location! Superb view to enjoy a calm, quiet and relaxing holiday. Nothing too much trouble for Gina the manager, so helpful, friendly and enthusiastic. A very welcoming place to stay in the very beautiful Fiskardo. Hope to return. Gina was waiting for us at 10pm, everything was perfect. Great location, perfect apartment, spotlessly clean, apartment serviced daily. Everything you could think of/needed. Fabulous apartment really lovely staff. Such a great holiday. The location along with the fantastic views from the apartment balcony. Fantastic place to watch the comings and goings off Fiskado Harbour very peaceful yet only 2 minutes walk into the town to enjoy all the wonderful restaurants and bars in the port. Just outside the apartments was a great little beach shaded by olive trees where you the swim in the clear blue Ionian sea. Very clean apartment cleaned every day and great owners who let us stay longer in the aparttment on our day of departure. Also lots of parking spaces close to the apartments. Lock in a great price for Anthi's Beach Apartments – rated 9.8 by recent guests! Just 350 feet from the scenic harbor of Fiscardo, Anthi's Beach Apartments offer an outdoor pool with sun terrace. They feature self-catering accommodations with views over the Ionian Sea. Free Wi-Fi is available in all areas. Tastefully decorated, all air-conditioned apartments of Anthi's Beach come with a separate bedroom. Opening to a furnished balcony or patio, each consists of a seating area with satellite TV and a kitchenette with dining table and mini oven with cooking hobs. Guests may relax at the sun loungers of the decked sun terrace by the pool, while enjoying panoramic sea views. A garden with plants and trees is offered. Fiskardo Beach is 30 feet away, while a restaurant, a café bar and a mini market for the general supplies can be found 500 feet away. 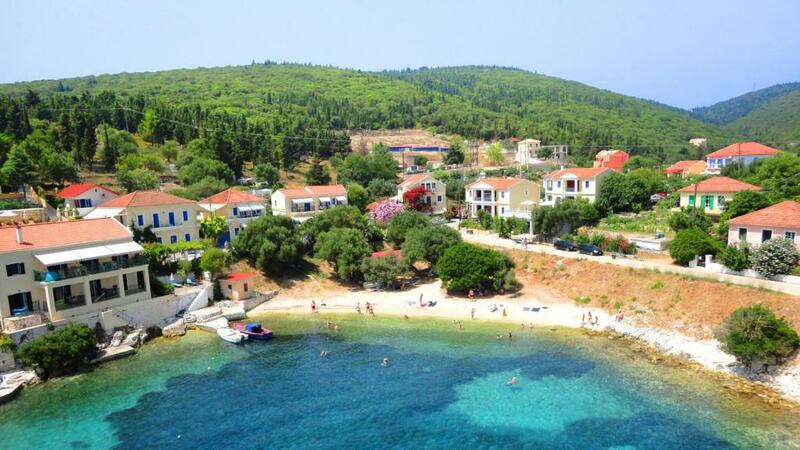 Foki Beach is at a distance of 1.2 mi and the picturesque seaside village of Asos is 12 mi away. Argostoli Town is 33 mi away and Cephalonia International Airport is 39 mi away. When would you like to stay at Anthi's Beach Apartments? Offering Ionian Sea views from its furnished patio, this air-conditioned and tastefully decorated apartment comes with a separate bedroom. It consists of a seating area with satellite TV and a kitchenette with dining table and mini oven with cooking hobs. Free Wi-Fi is provided. Offering Ionian Sea views from its furnished balcony, this air-conditioned and tastefully decorated apartment comes with a separate bedroom. It consists of a seating area with satellite TV and a kitchenette with dining table and mini oven with cooking hobs. Free Wi-Fi is provided. House Rules Anthi's Beach Apartments takes special requests – add in the next step! Up to two children under 16 years are charged EUR 10 per night when using existing beds. Anthi&#39;s Beach Apartments accepts these cards and reserves the right to temporarily hold an amount prior to arrival. Anthi's Beach Apartments accepts these cards and reserves the right to temporarily hold an amount prior to arrival. Please inform Anthi's Beach Apartments of your expected arrival time in advance. You can use the Special Requests box when booking, or contact the property directly using the contact details in your confirmation. If we had to be pedantic, our apartment could have been screened off from the pool area. When we sat on our balcony of an evening it felt a little open to the rest of the guests. This was only a very small issue but worth mentioning. Fantastic host. Perfect location.. simply stunning. Would definitely reccommed. Very nice host, excellent service, beautiful view, nice pool perfect for children, small beach close by, very clean and comfortable. Nothing was too much trouble the apartments were spotless and cleaned daily towels and beds were change every other day it was perfect and a real gem. We liked waking up with the sun rising and seeing the sea right there and skipping into it for a wake up swim. A quiet spot with Olive trees on the pebble beach. The lane in front was very sleepy. A very short walk along the water to the gentile, yacht filled harbour and restaurants. More beaches and coves along the coast that we enjoyed walking to and taking a little boat out for the day and exploring further was lots of fun. Anthis was perfect for what we were after, a great base for us that was entirely spotless and right on its own little beach. It had room for us both to unpack properly and a separate kitchen to stow our fresh fruit and Greek yoghurt for our morning breakfasts. We cld have done more cooking had we wished, we were distracted however by the local feasting to be had in Fiskardo. We also had a sitting room that connected to the balcony along with the bedroom. The housekeeping team and Gina were more than accomodating and couldn’t have been more welcoming or generous with their hospitality. Thank you Anthis! This is a real find. Perfectly located a short stroll from the bars and restaurants, opposite the small town beach. Really quiet at night. Balcony overlooked the beach giving a lovely view, and felt nice and private. The apartment itself was spotless, spacious and well equipped. The pool area is a real sun trap in the late afternoon, with comfortable loungers. Nice extra touches like a bottle of wine in the fridge, and snacks on the table. Gina arranged our airport transfers, and was a very accommodating host. We'd stay again without hesitation. Everything about the apartments apart from the pool a little on the small side and very slippery around it. The sofa beds a little uncomfortable. Everything else was perfect.